The "No videos to download on this page" message often means that the video (or the website) is incompatible with our downloader for Google Chrome, Edge, and Firefox*. Our Download This Video feature is designed to work with most popular video websites. However, it does not support sites where you need to login to watch a video. 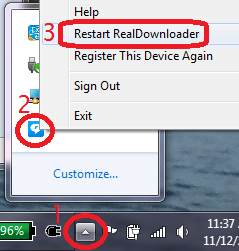 If the test download works, then you may be able to download your desired video either by using Internet Explorer or the RealPlayer browser. We have identified an issue with the latest version of Firefox (Version 53.0) where ‘Download This Video’ dropdown button will not find videos to download. We are actively working on fixing this issue. Until such time, please use Internet Explorer browser to download videos.